It's always a great pleasure for us to see UNO featured at the press. After the previous publications at "a vos MAC" magazine and at MacFormat magazine , UNO is on the press again! The year of 2006 finished with UNO bundled in issue n.176 of MacFormat 's DVD as part of the "How To Give OS X a Facelift" tutorial. 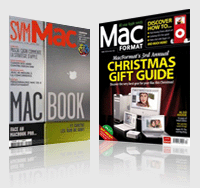 The year of 2007 began with UNO bundled in issue n.190 of the french based magazine SVM Mac 's CDROM as part of the article "Personnalize Mac OS X Gratuitement". We appreciate the spread the "word of UNO" around, and being present at the World's best Mac Magazines is for sure a good encouragement for us to keep evolving it.